see now this is what i want to feel from a Stoner Metal album, the wonderful experience of being high recorded on an album and then put in the microwave for a few minutes to make something that literally gave me headaches while listening to it, but again in a good way. 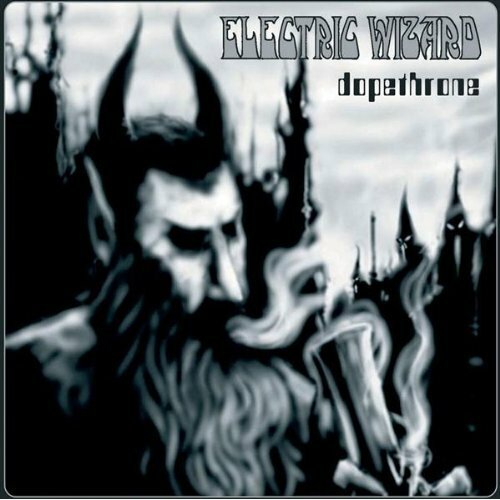 This is the experience that Electric Wizard wanted to give the listeners of this album and i'm glad to say they did a damn good job. ok... so a few more listen and all I can say is this. This album feels like I am watching a cohesive end of the world experience. It is excellent. This whole album is mind melting and dirty. The riffs... THE RIFFS! it flows so well from front to back and is just unbelievably replay-able. Spectacular, and I say cheers to many more future listens. This album is absolutely MASSIVE. I was pummelled with these mind boggling riffs for almost an hour and a half, it literally felt like I was trapped inside a giant bong. Main issue is you cant tell one song from the next but that doesn't take away from how technically imprrssive it is. One of my gateways into doom metal and one of my all-time favorites since. Funeralopolis alone would make this album a masterpiece. Purchasing Dopethrone from Amazon helps support Album of the Year. Or consider a donation?